The Economics of Cloud 2: Will It Drive Prosperity in 2011? There is a lot of talk about Cloud 2 in the wake of last week’s Dreamforce event in San Francisco. Salesforce CEO Marc Benioff has certainly been vocal in heralding the dawn of a new age and it would be useful to try to examine what we might be looking at. There are three relatively new technologies converging to make Cloud 2. All three technologies have been available for many years, though in less robust forms and with less powerful integration. The convergence is driven by their ubiquity, low cost and ease of use. They are social media, mobility and analytics. Together these technologies offer a future that is vastly different from conventional enterprise information processing served from a traditional data center or from a data center somewhere else on the Internet that made up the backbone of Cloud 1. Of the three, social media is the newest category. Most social products have yet to see their tenth anniversary and their sudden arrival and significant impacts are testimony to their power. Since social technologies are largely free, there is no issue of price points being reached but social tools are the ultimate network technologies and as Metcalf’s Law demonstrates, they are only useful if their market penetration is close to saturation. Social technologies’ ubiquity is dependent on the abundance of platforms—small hand held devices as well as more conventional computer technologies. Without lots of people using lots of computing devices, there is no hope for a product like social networking to take off in any meaningful way. Mobile devices are themselves the beneficiaries of huge infrastructure investments that have been ongoing since at least the 1980s when the first analog cell towers began sprouting along busy highways. The mobile infrastructure makes these devices practical and wide user adoption makes the services cheap with prices declining further over time. But that’s not everything. Social media generates a great deal of data about people, their needs and demands. But as social marketing expert, Thor Johnson tells me, most of that data is dirty and separating the good stuff from everything else, is a job we all need to take seriously in the enterprise. Dirty data is not simply a problem of de-duplicating a list. Social data might be correct but we need to understand its context—how and why it was generated—and that job is done by analytics. The third element of the technologies driving Cloud 2, analytics, has been with us for over three decades—as a yardstick, SAS Institute was founded in 1976 by Anthony Barr, James Goodnight, John Sall and Jane Helwig. But analytics always had a reputation for being cumbersome and for requiring a Ph.D. to operate it. Advances in analytics and user interfaces—not to mention the processing power of modern computers—has at last made it feasible to spread analytics to the masses. These three elements converging at this place and time are what’s driving the Cloud 2 revolution. They are examples of the long gestation periods needed to make what we affectionately refer to sometimes as an overnight success. What’s interesting is that this is all very reminiscent of the 1990s. Back in the 90s the productivity of the average worker increased significantly and the economy soared leading Alan Greenspan, Chairman of the Federal Reserve to say that economics had entered a new era of growth without inflation. But the laws of economics had not changed and the times simply reflected different inputs as well as the celebrated improved outcomes. Under normal economic conditions, a productivity increase, also known as improved output, always caused inflation and eventually economic dislocations such as recessions when the economy overheated. But none of that happened because technology took the place of labor increasing per worker productivity. We may be poised for a repeat of the 1990s as the economy rises from the ashes of one of the worst economic disasters of the last century. The cause of the earlier productivity increase was the massive investment in PC and network technologies undertaken by enterprises and businesses in the previous decade (the 80’s). That investment drove the productivity boom of the 90s and it’s possible that the investments that drive Cloud 2 are positioning the economy for a similar burst of productivity in the years ahead. But the next productivity boom will not come simply from dusting off the technologies we’ve had hanging around for decades. As in the 1990s the boom will come from using disparate technologies—mobile, social and analytics—in new ways. 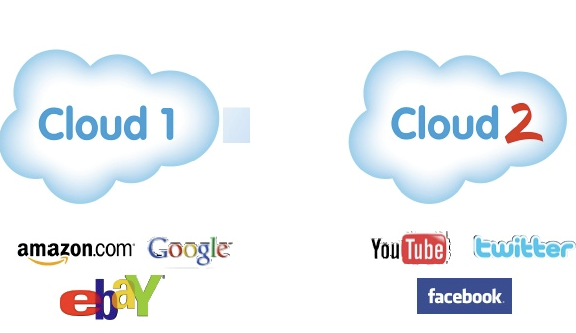 That’s the significance of Cloud 2 and it is why collaboration and social media is so important. We still have a learning curve to traverse though. A Harvard Business School study published a few months ago states that most companies surveyed are already either using social technologies or are in the process of implementing them. What’s lagging, according to the study is analytics. In the study, a much smaller cohort was running down the learning curve for analytics but the race has at least started. So from this I glean a couple of useful points. First, as analytics goes so goes the recovery and so goes your business. The faster you figure this out and devise a plan for implementing analytics the further ahead you’ll be. If you want to track the success and penetration of Cloud 2, track analytics because it’s the glue for everything else. Second, collaboration will bring with it many drag-along effects. For instance, once you can collaborate with a partner, a colleague or a customer, you won’t accept the time lag associated with convening a meeting. That said, you’ll need and want newer technologies that leverage the web to provide presence. Those technologies can be anything from web meetings and especially conferences to portals (remember them?) and certainly video. It remains to be seen if these ideas will take shape as described but classically, recessions end with new paradigms becoming established which leads to increased demand in many sectors and the cycle repeats itself. Salesforce acquires Heroku: Dork Move, guys. Database.com - Why? How? What? Salesforce’s Database.com: Fat SaaS Here We Come!